In this day and age it is uncommon for someone not to own a cell phone. In fact, it is almost a necessity. Technology is vital to everyday life, so much so that computer skills are essential for most jobs now. The cell phone was originally intended to be a convenient way to make phone calls when out and about away from home. However, since the introduction of the smartphone people have been throwing their old flip-phones in the trash as they are now able to have almost all of the capabilities of a computer at their fingertips while on the go. However, what kind of a toll does the relentless staring down at our cell phones and constant sitting at a computer desk have on our cervical and lumbar spine? What does this increased stress on the cervical and lumbar spine have on healthcare costs? According to Mayo Clinic, the third most common reason for all non-acute doctor visits is back pain. Total estimated medical costs associated with back and neck pain is now over $100 billion per year. The increased accessibility to nearly anything we could want to do or access on our phone has lead to amplified usage, resulting in increased time peering down at our phones. 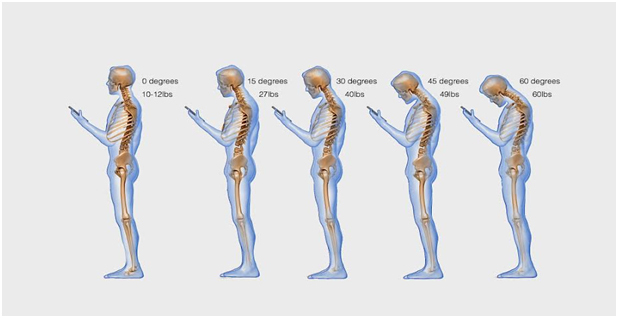 Frequently looking down at a cell phone produces stress on the joints and muscles of the cervical spine. This stressful posture is often referred to as “text neck,” which is caused by leaning over a cell phone for extended periods, or from the cumulative effect of many shorter periods over time. The reason this is important is because it is an increasing problem and has even been described as an epidemic within the healthcare community. Tilting the head down to look at a cell phone increases stress on the cervical spine through increased biomechanical forces and through the addition of gravity. The average human head weighs between 10-12 lbs. With normal posture at 0 degrees of flexion there is approximately 10-12 lbs of force on the cervical spine. Looking directly down at a phone can increase flexion of the neck to 60 degrees, which may produce forces upwards of 60 lbs of pressure on the cervical joints and muscles. In the study published by Dr. Hansraj, it is reported that people spend an average of two to four hours per day with their heads tilted over their smartphones reading and texting. Cumulatively, this is 700 to 1,400 hours a year of excess stress on the cervical spine. Furthermore, a high school student could spend upwards of 5,000 hours per year slumped over their phone. These risks can be mitigated through focusing on maintaining proper cervical spine posture. This generally involves keeping a neutral spine, focusing on keeping the eyes at the same level as the horizon and keeping the ears, shoulders, and hips in vertical alignment. Another easy solution would be for us to put our phones down more often, but some more feasible solutions may be to focus on proper posture and holding our phones closer to eye level. Humans are not meant to sit for extended periods of time, day in and day out. We are designed for movement and a sedentary lifestyle can be very harmful to overall health. The average American spends 9-10 hours per day sitting. This type of sedentary lifestyle decreases metabolism, decreases calorie expenditure, and increases the stress hormone cortisol. Additionally, sitting for too long produces poor posture that negatively effects spine posture and creates increased stress on the lumbar, pelvic, and thoracic spine joints and muscles. Sitting, especially while leaning forward, has some of the most detrimental effects on lumbar spine load and forces placed on the intervertebral discs. Low back pain presents a huge problem that more than 80% of Americans will experience at some time in their lives. Beyond the increased stress on the healthcare system and amplified costs to patients, a large portion of the $100 billion+ total costs of low back pain are attributed to medical absence from work and decreased productivity. There are many injuries that can occur from prolonged sitting. 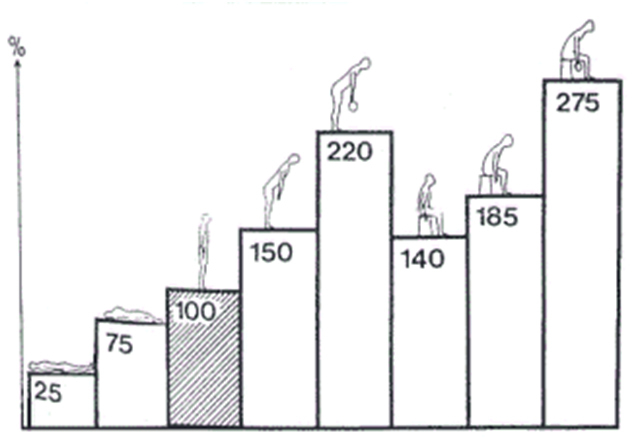 As demonstrated in the image above, sitting increases stress on the intervertebral discs. These discs are designed to expand and contract when you move, which allows them to rehydrate and absorb vital blood and nutrients. Sitting can compress these discs and decrease shock absorption and flexibility over time. This can lead to an increased risk of herniating a disc in the low back. Additionally, excessive sitting can lead to weak and atrophied muscles in the abdomen, low back, glutes, and hip musculature. Weakening of these muscles can lead to pain and decreased function throughout simple activities of daily living. Working out for 30-90 minutes cannot offset 9-10 hours of sitting per day. In order to prevent the detrimental effects of prolonged sitting, it is recommended that you take frequent breaks to stand up and walk around. Standing up to stretch tight muscles may also be helpful. When you’re not able to take frequent breaks or if they are difficult or impossible to do while at work or home, it is recommended that you continuously focus on good posture while sitting. If you do develop back or neck pain from prolonged sitting or technology use, please consult a qualified healthcare professional like 5280 Cryo & Recovery. There are many conservative treatments that can help with these injuries. Some of these treatments include chiropractic, physical therapy, active release technique, cryotherapy, and proper stretching and strength training instructions. The bottom-line, increased technology usage such as looking down at your phone or sitting at a computer for long periods of time can have detrimental effects on your spine. Taking frequent breaks or ergonomically changing the way that you use your phone or sit at your computer can go a long way towards protecting your spine. 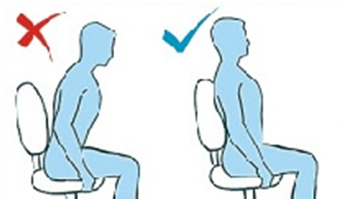 Focus on an erect posture with the ear, shoulders, and hips in alignment while sitting. If you are using your phone, practice keeping your head titled up and level. Incorporating more movement and stretching in your daily routine can be very helpful at preventing back and neck pain as well as keeping your body functioning the way it should. If you do develop back or neck pain there are a lot of great treatment options. Just remember, proper posture, frequent movement, and lots of stretching can go a long way toward preventing detrimental back and neck pain from technology use.